I participated in an Ambassador campaign on behalf of Mom Central Consulting for Kohl's. I received promotional items and product samples as a thank you for participating. Disney fans rejoice! Your local Kohl’s just got a lot more magical with the collaboration between Disney and the Kohl’s children’s line, Jumping Beans! The collection named ‘Magic at Play, is a one-of-a-kind collaboration that’s playful and fun for all ages. I’m also extremely excited to announce that I’m officially a Kohl’s Disney Jumping Beans Ambassador(!!) Which means I will be bringing you exclusive information, as well as sneak peeks, while also sharing my thoughts and opinions on the entire collection. I couldn’t be more excited! (And not because I had once hoped of becoming a member of The Mickey Mouse Club), but because I took a look at the first themed capsule collection, ‘Americana’, and it made me smile for ear to ear! This adorable line is available in infant, toddler, and boy/girl sizes (4-7), and features the most recognizable Disney characters in the world – Mickey and Minnie! Its cheerful pieces are mostly red, white, and blue (with a little pink, thrown in there too), and captures the playful nature, energy, enthusiasm and curiosity of the beloved Disney duo. 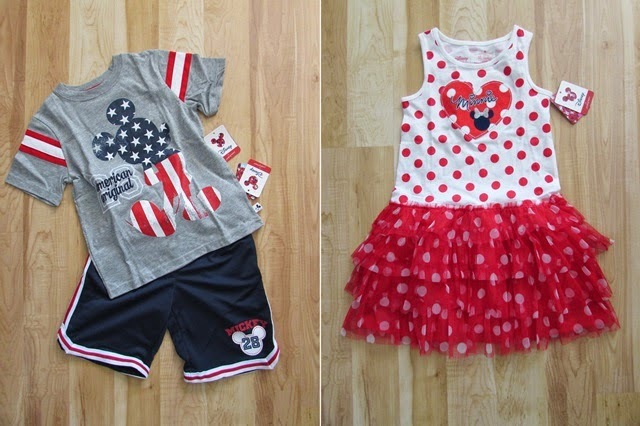 I received a sample of the Americana collection a few days ago, and loved the practicality of the Mickey Mouse American Original t-shirt and shorts for boys. While the combination of polka dots and tulle on the girls Minnie Mouse dress is just as cute as button! I can’t wait to see more of this collaboration - and of course go back to do some more shopping too! Be sure to keep checking back each month to see more of the Magic at Play collection, and also see how Arianna styles her new outfits! In the meantime, Mom Central is graciously giving one of my readers a $100 Kohl’s gift card so you can shop the collection yourself! To enter to win just follow the instructions below. I love the Disney Mickey Mouse original Mickey hoodie! I love Disney! These would be so fun for my little one on the way and nieces and nephews! I would start with the glitter tutu! Disney Mickey Mouse Mesh Shorts by Jumping Beans® - Boys 4-7x.....they have some fun items!! I like Disney Minnie Mouse Striped Tutu Dress. I love the Minnie Mouse Polka Dot tutu dress! I would get the Minnie Mouse polka dot hoodie. 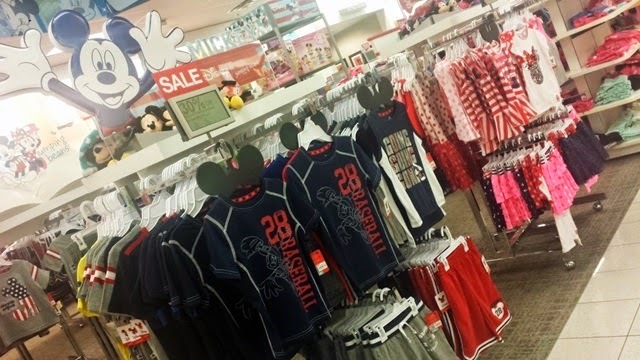 I would get the Mickey Mouse Baseball Tee. I LOVE The Disney Minnie Mouse Striped Tutu Dress! I like the Mickey Mouse American Original t-shirt and shorts. I like the Disney Minnie Mouse Polka-Dot Tutu Dress by Jumping Beans®. I love the Disney Mickey Mouse Mesh Shorts by Jumping Beans® . The original Mickey Hoodie would look great on my great nephew. I would love to get the Disney Mickey Mouse Stripe Tee by Jumping Beans® - Boys 4-7x for my grandson! I'd get the Minnie mouse bow tank and the hoodie. Love the Disney Minnie Mouse Polka-Dot Hoodie by Jumping Beans! Oh I really love the Going Going Gone Boys Muscle Tee! So cute for summer! I like the boys red Mickey Mouse soccer shirt with the matching shorts. I really like the boys original Mickey grey hoodie with blue stripes on the bottom. I like Disney Jake and the Never Land Pirates Bed Tent. I like the Minnie Mouse Bermuda Shorts. I think my son would look cute in the Disney Mickey Mouse "American Original" Tee by Jumping Beans® shirt. I would like the Disney Mickey Mouse "Original Mickey" Hoodie by Jumping Beans for my son. I love the minnie mouse polka dot tutu dress. I would get the Disney Minnie Mouse Heart Dress. My favorite is the Disney Minnie Mouse Polka-Dot Hoodie by Jumping Beans®. The Minnie Mouse Polka Dot Tutu dress! The Disney Princess Dress-Up Nightgown and Disney Princess Palace Pets "Adorable" Dogs Tee. I'd love Disney Minnie Mouse Bow Dress by Jumping Beans! I like the Minnie Mouse Polka-Dot Hoodie. I think my nephew would like the Disney/Pixar Cars "Friends to the Finish" Swim Trunks. He is obsessed with Cars right now. I like the Disney Minnie Mouse Polka-Dot Tutu Dress by Jumping Beans® - Girls 4-7 for my daughter!